Note: McFatty Mondays is no longer!! Instead, I will be posting Momma's Monday Check-in. Join me as I eat and exercise my way through the next 32 weeks. Morning Sickness: Is at its worst in the evening, which is driving me nuts. Cravings: Last week was bizarre, and this week I only want to eat clean food! Spicy is out, cheese, eggs, and tomatoes are still in. Sleep: I wake many nights around 3:30am and stay up until 5:30/6:00am, which really makes the daytime tough. I can't live without: My Snoogle pillow, even though I'm still tossing and turning. I am looking forward to: I know it's a little early but I'm trying to figure out what we're going to dress up as a family for Halloween. Any ideas? Aha Moment: My new first trimester mantra: "I'm not out of shape, I'm just pregnant." Milestones: Seeing Little Sears (and a beating heart) on Ultrasound! Exercise: I more or less gave myself permission to take a break this week, and I have to remind myself to think long term. After five days of little more than couch lounging I slept well Friday night, and woke up with a strong desire to go running. So I did. Three miles later I felt great and I think the important thing at this stage is to take advantage of the moments when I do feel like exercising, and cut myself some slack when I'm too tired or nauseated to put forth the effort. 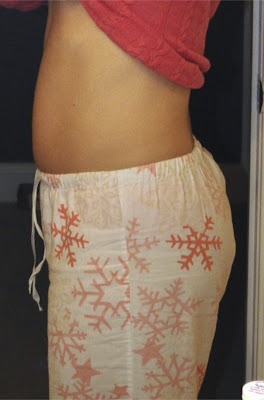 There are only a few weeks left of the first trimester blahs, and after that I'll be back to my routine with plenty of time for working on pregnancy fitness. Diet: The good thing about having a "bad" week is that the icky feeling that lingers is usually all the motivation I need to refocus. This week I'm getting back to whole foods and structured meals and snacks--not 24 hour buffet. Goal's for the upcoming week: Take advantage of the mornings when I typically feel good--runs, walks, gym time, I don't care what the activity. And if it works out that I'm in the mood for breaking a sweat in the evening as well, all the better. The evening was always my worst time of day in all my pregnancies. Glad to see all is going well. The evening was the WORST. I used to lay on the couch & welcome death. But I'm so impressed at you running - I did the same thing. If I felt like working out, I did. If I didn't, then I didn't beat myself up about it. Growing a human is tough work! Oh shoot, I just realized I know you already! We were both Bake and Bloggers - sorry about that!! !